Believe it or not, according to the Department of Transportation, summer, not winter, is the most dangerous time of the year to be on the road. Accidents that result in fatalities occur 18 percent more often in the summer months June through August when compared to the winter months December through February. So, when preparing to be out on the road traveling this summer, it is best to make sure that you and your family are safe. Let's take a look at some of the potential hazards that you may face and explore some tips for how you can avoid them. It is easy to overlook the state of your tires. Not only will checking your tires help keep you safe and out of avoidable accidents, but it will also save you money in the long-run. Tires that are properly maintained offer the driver better handling and increased gas mileage which is important in the summer when the gas prices go up. To accurately gauge if you need to replace your tires, insert a quarter into your tire's tread with Washington's head pointing down. If no part of Washington's head is covered by the tread then you are under an 1/8 of an inch and should seriously consider getting new tires. Old tires can lead to accidents and costly repairs, so stay on top of your tires and make sure they are in good shape before you hit the road. When packing the car for a weekend trip or longer expedition make sure that you are not exceeding your car's payload. The owner's manual in your car will tell you all the information that you need to know about the maximum weight of people and cargo you can carry. If you are over packed you will have a hard time seeing out of your windows, and this could potentially lead to accidents on the road. Plus, if your car is too heavy you are going to have problems handling which can very quickly lead to accident or injury. 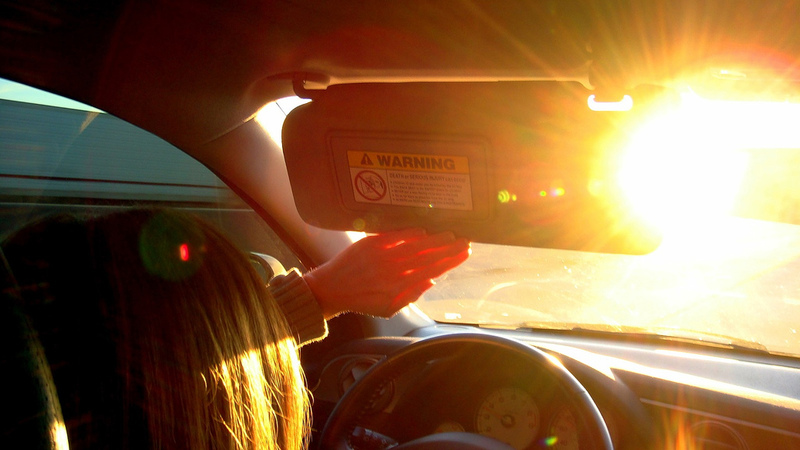 Glare from the sun and other metallic or shiny objects on the road is a real concern. Being blinded while driving is not ideal for your safety or that of your passengers. Bring sunglasses to aid your vision, and make sure that you bring tons of water for you and your passengers. It is easy to overheat and get dehydrated if you spend too many hours in the car without adequate hydration. Any sort of glare or impairment from heat or dehydration can factor into potential accidents, so be careful and plan ahead. Rain storms come out of nowhere in the summer and can bring down a lot of water with them. With the rain comes slick and dangerous roads. In the first thirty minutes of rain fall the oils and dirts on the road mix with the water and create a slick and slippery surface. If you are not careful it is easy to lose control of your vehicle in these conditions, especially if you have bad tires or are weighted down too much. After about thirty minutes of rain fall most of the slick oils and dirts should be washed off the road, but it is important to still drive cautiously when it is raining or has just recently rained. Increase your following distance to four seconds or more when behind cyclists or motorcycles. Use extreme caution when going through construction zones or areas with heavy pedestrian traffic. Never share lanes with bikes or motorcycles. Be vigilant always when driving an automobile. The summer months are great for being on the road and traveling with friends and family. Be sure to be safe and have fun this summer!